There is a venerable saying among Native Americans of the Pacific Northwest: "No fish, no blackfish." The depletion of salmon stocks, especially the fat- and calorie-rich Chinook salmon favored by fish-eating orcas of Puget Sound, is hindering the recovery of the endangered Southern Resident Killer Whale population, the favored target of captures for entertainment purposes at places like SeaWorld in the 1960s and 1970s. Where did the salmon go? Overfishing and PCBs in the Sound have certainly contributed to the life-threatening problem for the whales, but the real culprits are dams on rivers that drain into regional waters, collectively known as the Salish Sea. But now, some dams are coming down. And in nature's miraculous manner of recovery, fish are starting to return upstream to breed in the formerly blocked rivers. This month, the final remnants of the Elwha Dam, on the Olympic Peninsula's Elwha River and Glines Canyon Dam, built eight miles upstream, will be removed and partly because neither dams had fish ladders to facilitate salmon runs. A new documentary, "DamNation," chronicles the damage caused by many dams, argues that the most harmful ones should come down and shows how their demolition can engender natural recovery. This film "explores the sea change in our national attitude from pride in big dams as engineering wonders to the growing awareness that our own future is bound to the life and health of our rivers," the producers wrote. The film, available on demand and via iTunes and winner of the 2014 SXSW Audience Choice Award, "moves through rivers and landscapes altered by dams, but also through a metamorphosis in values, from conquest of the natural world to knowing ourselves as part of nature." Ben Knight, co-director of DamNation, recently spoke with The Dodo via email about the film. He said it was spawned by Yvon Chouinard, founder of the Patagonia clothing company, and biologist/underwater photographer Matt Stoecker. "They've both been heavily involved with river restoration, and thought it was about time people learned more about dams and their impacts on watersheds all over the country," Knight said. "Yvon and Matt approached [co-director Travis Rummel] and I to create a film that could make a pretty obscure, complicated and controversial subject worth watching." The filmmakers anticipated a production schedule of about one year, but the story kept evolving, stretching into a three-year endeavor. "The timing was perfect actually, because the two largest dam removal projects in history were both happening in the Pacific Northwest [on the Elwha and the White Salmon River]," Knight said. "We had this amazing opportunity to film those projects from start to finish." 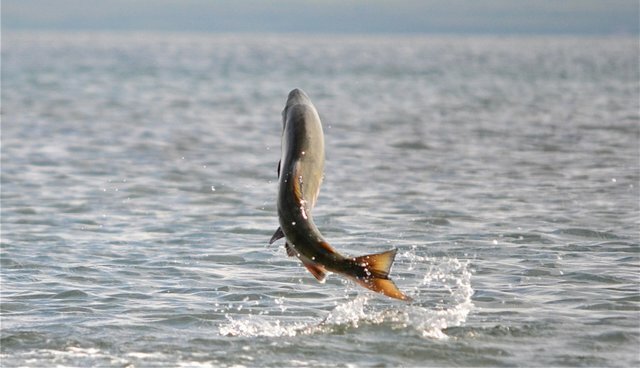 Salmon runs on both Washington State rivers, "are rebounding faster than biologists could have dreamed. They're coming back by the thousands just a year after dam removal," Knight said. "Chinook salmon are a critical part of an Orca's diet - opening up historic chinook spawning grounds will clearly benefit marine mammals." Dam proponents argue that the massive structures provide water for agriculture and electricity, which is more important to the nation than salmon conservation. But Knight disagrees. "Nothing on this planet is more important than a free, sustainable food source that returns every year to feed us, a wealth of other animals and to pump nutrients upstream," he said. "Agriculture and electricity are both critical to our livelihood, but there are ways to balance these things. We don't have to trade salmon for power - it's not that black and white. "The most important thing for me is for our audience to be moved by the film," Knight said. "We've succeeded if people leave the film and give a little more thought to the health of the river in their backyard - if someone questions the need for an antiquated dam on their local watershed, that's a huge success." The filmmakers have also issued a call to action to remove the four dams on the Lower Snake River in Eastern Washington and a petition can be signed here. With so many powerful interests supporting dams - ranchers, farming groups, energy companies - Knight is a bit surprised by the lack of pushback the film has received. "We're not advocating for the removal of all 80,000 dams in the country - we're advocating for the removal of dams that cause more harm than can be justified by their benefits," he said. "There are thousands of dams that were built with a very short-sighted mentality, and many need to be reevaluated." That reevaluation may well save new generations of Southern Resident Killer whales, including the newest member of L-Pod, who showed up this summer: The first calf to appear since 2012.